The ever-increasing global energy demand and the risks we face in terms of global warming and pollution suggest the need of alternative sources for energy and fuels. Liquid and gaseous fuels derived from biomass represent a promising alternative in this sense. 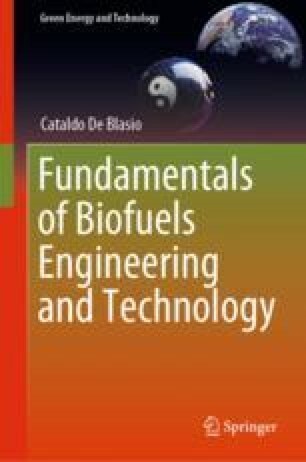 Biofuels demonstrate positive qualities respect to other fuels types; they can be transported easily and show good calorific properties. Particularly, liquid fuels are very convenient for the human need since they store a reasonable amount of energy in very little volume, and they can be transported easily. Studies have been conducted by several organizations concerning biomass supply and its usage in energy conversion, and they are reported in this section. Give me a lever and I will move the Earth. Sentence generally attributed to Archimedes of Syracuse, Sicily. 287–212 BC. The author of the: On the Equilibrium of Planes and father of the first laws of mechanics. Battjes, J. J. (1994). Global options for biofuels from plantations according to IMAGE simulations (No. IVEM-SR-77). Rijksuniversiteit Groningen (Netherlands). Interfacultaire Vakgroep Energie en Milieukunde. Retrieved from http://inis.iaea.org/Search/search.aspx?orig_q=RN:26031212. Campbell, C. J., & Laherrere, J. (1998). The end of cheap oil. Scientific American, 278(3). Retrieved from https://www.jstor.org/stable/26057679. Grubler, A., Jefferson, M., & Nakicenovic, N. (1996). Global energy perspectives: A summary of the joint study by IIASA and world energy council (Monograph). Retrieved July 9, 2018, from http://pure.iiasa.ac.at/id/eprint/4860/. Nakicenovic, N., & Riahi, K. (2001). An assessment of technological change across selected energy scenarios (Monograph). Retrieved July 9, 2018, from http://pure.iiasa.ac.at/id/eprint/6521/. Nakicenovic, N., Alcamo, J., Grubler, A., Riahi, K., Roehrl, R. A., Rogner, H.-H., & Victor, N. (2000). Special report on emissions scenarios (SRES), a special report of working group III of the intergovernmental panel on climate change. Cambridge: Cambridge University Press. Retrieved from http://pure.iiasa.ac.at/id/eprint/6101/. Soerensen, B., Meibom, P., & Kuemmel, B. (1999). Long-term scenarios for global energy demand and supply. Four global greenhouse mitigation scenarios. Final Report (No. IMFUFA-TEKST--359). Roskilde Universitetscenter (Denmark): Inst. for Studiet af Matematik og Fysik samt deres Funktioner i Undervisning. Retrieved from http://inis.iaea.org/Search/search.aspx?orig_q=RN:30029769. Statista. (2018). World—Total population 2007–2017 | statistic. Retrieved December 31, 2018, from https://www.statista.com/statistics/805044/total-population-worldwide/. Swisher, J. (1993). Renewable energy potentials, Chap. 3. Energy, 18(5), 437–459. https://doi.org/10.1016/0360-5442(93)90022-6. U.S. Energy Information Administration. (2013). International energy outlook 2013. Retrieved from http://www.eia.gov/forecasts/ieo/.